The Christmas story swings along to the beat of 'The House that Jack Built' in this colourful book. Great for kids aged under 6! 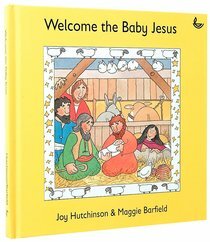 About "Welcome the Baby Jesus"
A retelling of the story of the nativity. Written with the rhythms of The House that Jack Built, the repetition and gentle poetry makes this a perfect read-aloud gift. Maggie Barfield has a vast experience of storytelling to young children and knows what will appeal. She has been involved with Scripture Unions SALT and Light programmes for 20 years. She developed the Tiddlywinks range and is currently the editor of Bubbles, the Light resource for 5s and under. She is committed to ministry with young children and trains others in this field.